I failed to take my good camera with me to my parents' house last night, but I had to share some quick phone snaps. It occurs to me how unfamiliar a lot of people are with the Passover dinner that I know. Nary a brisket, matzoh ball, or jellied, goopy ball of gefilte fish in sight. Jewish food as its known in most of the United States has nothing to do with what I grew up with. Bagels and lox, pastrami on rye, knishes and the like all come from the Ashkenazi tradition. As a Sephardic Jew, and specifically an Iranian one, my cuisine matches where I come from: more spices and fresh herbs and vegetables, lots of sweet and sour flavors from using fruit in our savory dishes, and at this time of the year, the best distinction of all: unlike Ashkenazis, Sephardic Jews eat rice during Passover. Because we might starve otherwise. Here are a few shots from my parents' house last night. 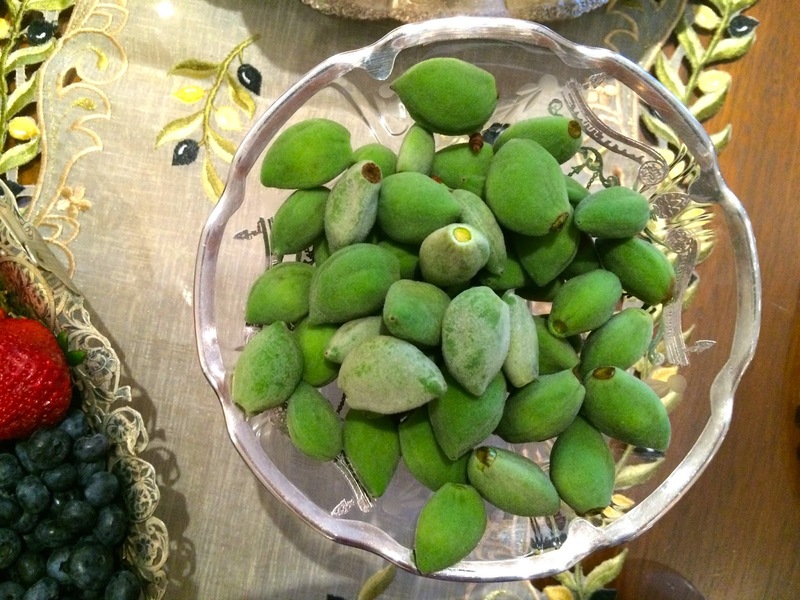 Fresh almonds to greet guests. Green and fuzzy, crunchy and tart. Each year for Passover, my mom buys the best nuts she can find, and washes, salts, sun-dries, and roasts them herself. I've never had a better hazelnut (or forty) and I'm not above cherry-picking for them, especially if my sister is looming over my shoulder. Last night, my mom served a mix of pistachios, hazelnuts, and almonds in this gorgeous silver bowl from Iran, inherited from my paternal grandparents. Meanwhile, in the kitchen, my mom's oldest sister prepared nargesi -- an eggy casserole of fresh herbs and tiny meatballs* -- as her daughter, granddaughter, and great-grandson looked on. Three kuku sabzis, on deck. 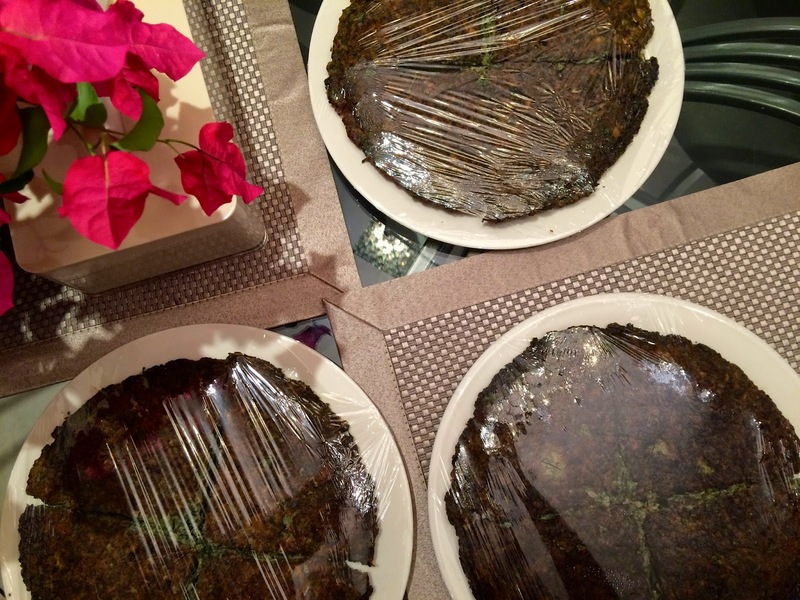 Among Iranian Jews, you use kuku sabzi -- a bright herby frittata with crisped edges -- for a memorial blessing. Passover corresponds with the anniversary of the death of my maternal grandmother, so we remember her each year with kuku sabzi. Whereas Ashkenazi Jews use horseradish as their bitter herb, we have a bitter lettuce (though admittedly this year's romaine was not the most bitter choice). Where Ashkenazi Jews dip parsley in saltwater, we dip the pale inner stalks of celery into vinegar. Our haroset recipe, long ago handwritten by my paternal grandfather for each of his kids, is a balanced blend of several nuts, fruits, spices, and wine. Though we no longer grind meat at home, my dad pulls out the hand-crank meat grinder every year to give the haroset its perfect texture. And yes, Maxwell House hagaddah. I mean, come on, we're still Americans. Oh, we also run around the table whipping each other with scallions. The full dinner spread -- almost. You'll note that we're not even done setting the table, and there is already tahdig -- the crispy saffron rice from the bottom of the pot -- in people's plates. We really are polite people; it's just that hot of a commodity. However you're celebrating, and whether you're celebrating, here's to expanding our worldview and eating well -- and at best, both at the same time. * Note that Iranian Jewish nargesi, for whatever reason, is totally different dish rom the Muslim dish of the same name, though the latter looks delicious as well. Love your post! I went to my family's Russian-Jewish Seder last night, complete with Maxwell House Haggadah...because that American convenience runs deep! hehe.. those haggadahs really define a generation! Gorgeous post, Tannaz! Everything looks delectable.